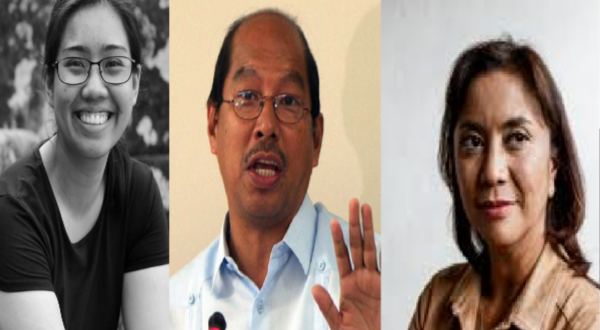 The Public Policy head of the biggest social media in the country, Facebook Philippines, was a trusted consultant of Vice President Leni Robredo, and former Finance Secretary, Butch Abad, revealed by the blogsite "Thinking Pinoy". This blogsite, run by RJ Nieto, made its way to fame after it revealed several issues from the past administration ran by President Noynoy Aquino. 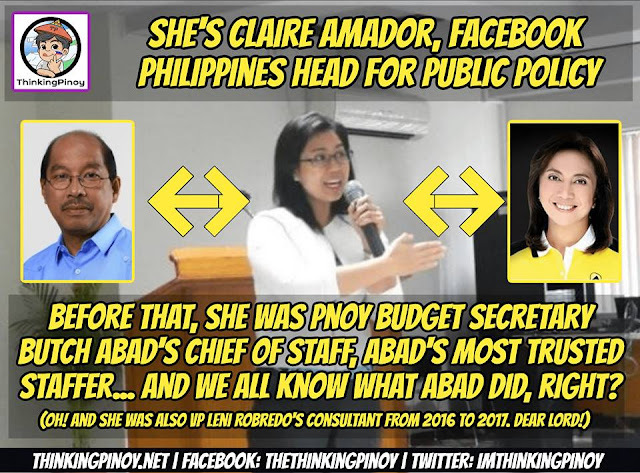 Nieto said that this head is Clare Amador, who once served as Abad's Chief of Staff and later on, as Vice President Leni Robredo's consultant. "Yes, we're talking about the same Abad involved in the DAP scandal, the same Abad who issued SARO's for Dengvaxia and the same Abad who funded the Department of Health (Philippines)' ghost health centers," he said. "Kung ano si SAP Christopher Bong Go kay Pres. Rody Duterte, ganoon si Clare Amador kay DBM Sec. Abad." According to the post, highly placed sources said that when the issue is raised, the administration of Aquino would go to Amador. "Well, we all know what the Aquino Administration did with the National Budget, right?" it added. According to the report, Abad left the DBM after LP's loss in the 2016 elections, and Amador wasted no time as she transferred to the Office of the Vice President. She was VP Leni Robredo's consultant from 2016 to 2017. The FB Head even became the Head Executive Assistant for the 2010 Noynoy Aquino-Mar Roxas presidential/vice-presidential campaigns. The blog called Amador "dilaw na dilaw", which means that she is biased towards the Liberal Party, which the blog has been continually criticizing. Abad has previously been accused of graft and corruption for alleged participation in the Development and Acceleration Program scandal under the Aquino administration. To now the allegations remain as nothing more. Amador in 2014, defender her boss after allegations of his involvement in the pork barrel scam through her Facebook account. "You should really be using more of what he has ACHIEVED, rather than what he talks or plans to do. From your writing, it sounds like he is one helluva talker. Why are you telling us how much he had to endure growing up? Every[one] suffers growing up. It surprised me that you include a snippet about forgetting the password of a facebook account, not to mention forgetting what email address used to make it. That’s a glimpse of poor organization and perhaps lack of focus. I’m not saying anything bad about him, but what I’m trying to say is, you probably shouldn’t have written this," she said in an article published by Rappler. Did you know that Facebook Philippines' Head for Public Policy Clare Amador was Department of Budget and Management Sec. Butch Abad's Chief of Staff, with the rank of undersecretary, for six years from June 2010 to June 2016? Yes, we're talking about the same Abad involved in the DAP scandal, the same Abad who issued SARO's for Dengvaxia and the same Abad who funded the Department of Health (Philippines)' ghost health centers. Kung ano si SAP Christopher Bong Go kay Pres. Rody Duterte, ganoon si Clare Amador kay DBM Sec. Abad. Highly-placed government sources told Thinking Pinoy that whenever anyone raised issues with the budget during the Noynoy Aquino administration, Amador was the go-to guy. Well, we all know what the Aquino Administration did with the National Budget, right? Abad left the DBM after LP's loss in the 2016 elections, and Amador wasted no time as she transferred to the Office of the Vice President. She was VP Leni Robredo's consultant from 2016 to 2017. Amador was also the Head Executive Assistant for the 2010 Noynoy Aquino-Mar Roxas presidential/vice-presidential campaigns. Dilaw na dilaw 'to, through and through. Grabe.